It's most unfortunate that the public is currently unable to view the screens and theatrical models John Heartfield created for playwrights such as Bertodlt Brecht. They are stored in the Heartfield Archiv in the Akademie Der Künste in Berlin. John J Heartfield continues to make every effort to negotiate with the Akademie Der Künste so that very high-resolution photos of these wonderful pieces of art can be available for display to the public. Bertolt Brecht (Feb. 10, 1898 - Aug. 14, 1956) was a world-renowned poet, playwright, and theatrical reformer. His epic theatre departed from the conventions of theatrical illusion. 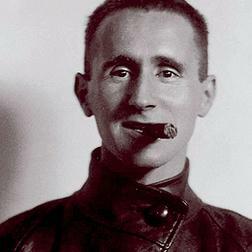 Brecht and Heartfield became lifelong friends and artistic collaborators after they met in 1924. John Heartfield was a key element in Brecht's creation of the "Alienation Effect" [Verfremdungs-effekt] in theatre. Heartfield's late arrival (due to a broken down streetcar) with screens he built as staging for a Brecht play caused the playwright to halt the production and poll the audience. Breaking the third wall, Brecht asked the audience how should the production continue, giving them four choices that involved the sets. The audience voted to start the play again with Heartfield's sets. Brecht is perhaps best known for "The Three Penny Opera," which achieved worldwide acclaim.